Hummingbirds are among the smallest of birds, they are native to the Americas where there are over 330 known species. The ‘humming’ part of their name comes from the noise of their wings which in smaller species can beat over 80 times per second. 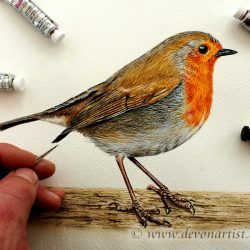 The size of the painting is approx 270mm x 203mm (10.6″ x 8.0″), however it is worked on paper which is approx 310mm x 230mm (12.2″ x 9.1″). 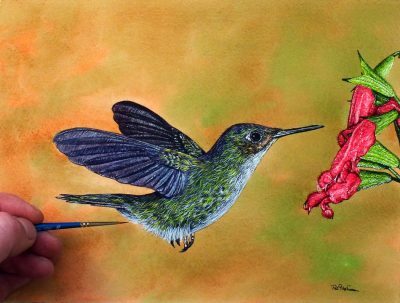 The hummingbird has been painted on an excellent quality watercolour paper using the finest of brushes for the tiny detail produced.